On 21 September 2018, 280 million km from Earth, a roughly 1.5 square-metre cube descended towards a primitive space rock. 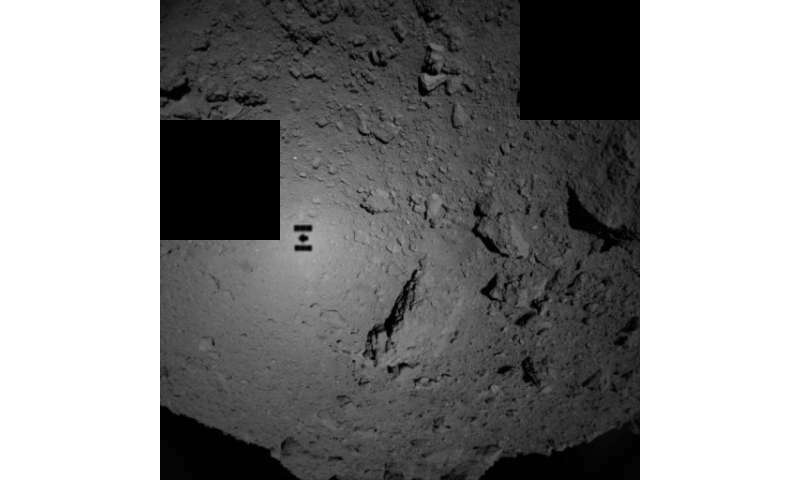 After years of planning and 4 years in flight, this tiny spacecraft captured this 'shadow selfie' as it closed in on asteroid Ryugu, just 80 metres from the remnant of our Solar System's formation, 4.6 billion years ago. The Hayabusa2 spacecraft is operated by the Japanese Space Agency (JAXA), supported in part by ESA's Estrack Malargüe deep-space tracking station. The spacecraft carries four small landers that will investigate the asteroid's surface, all four designed to gently fall onto the surface of the rocky boulder, taking advantage of its low gravity environment. Around the time this remarkable picture was taken, the spacecraft released its two MINERVA-II1 rovers which have since successfully landed and demonstrated an ability to hop around this rock-strewn body. "I cannot find words to express how happy I am that we were able to realize mobile exploration on the surface of an asteroid" enthused Yuichi Tsuda, Hayabusa2 Project Project Manager, "I am proud that Hayabusa2 was able to contribute to the creation of this technology for a new method of space exploration by surface movement on small bodies." The next stage will see the Mobile Asteroid Surface Scout (MASCOT) lander released onto the asteroid's surface. Developed by the German Aerospace Center (DLR) in cooperation with the French Space Agency (CNES) MASCOT has enough power for a 12-hour mission, in which it will analyse the asteroid's surface at two different sites. The Hayabusa2 spacecraft itself will collect three samples from Ryugu, bringing them back to Earth in December 2020. These strange specimens will provide insights into the composition of this carbonaceous asteroid—a type of space rock expected to preserve some of the most pristine materials in the Solar System. As well as hopefully shining light on the origin and evolution of the inner planets, and the sources of water and organic compounds on Earth, this knowledge should help in efforts to protect our planet from marauding masses that come too close for comfort to our home planet. Understanding the composition and characteristics of near-Earth objects is vital to defending ourselves from them, if one were to head in our direction. ESA's proposed Hera mission to test asteroid deflection is an ambitious example of how we can get to know these ancient bodies better, all in the name of planetary defence.